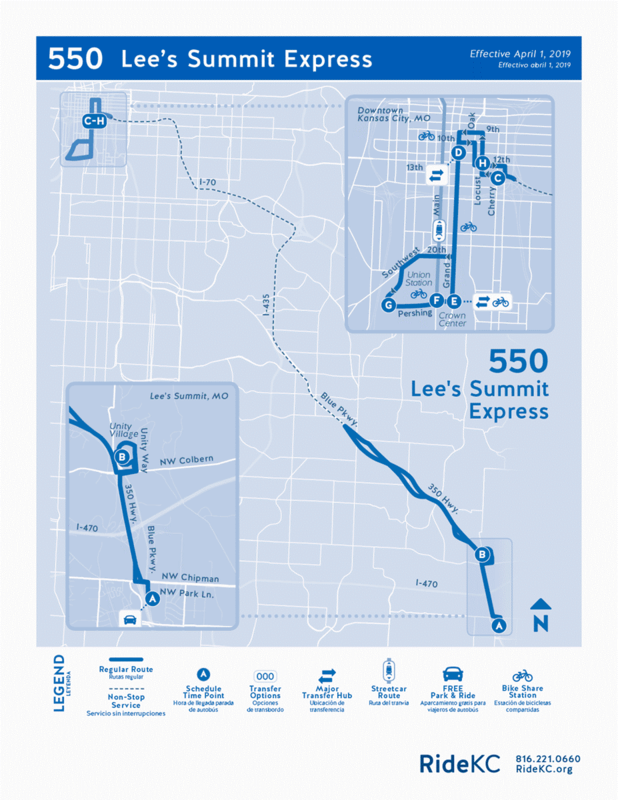 Beginning April 1, 2019, the 550 Lee’s Summit Express will offer three morning and three afternoon trips from the park-and-ride lots at Chipman and 350 Highway into downtown Kansas City, Mo. The second and third trips in the morning and afternoon will be merged into one trip. The arrival and departure times of the existing first and last trips remain the same as current schedule. See new schedule posted above. This change is done in partnership with our funding partner the City of Lee’s Summit. New schedules will be posted online and available in print March 1. For route and schedule information, call the Regional Call Center at (816) 221-0660, weekdays from 6 a.m. to 7 p.m.